Sigil epub ebook editor reached the 0.9.9 release a few days ago. 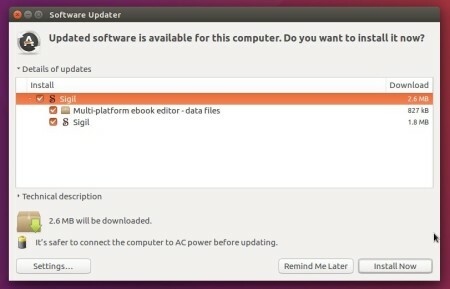 Here’s how to install it in Ubuntu 16.04, Ubuntu 17.04, Ubuntu 17.10, and higher via PPA. Ability to limit/disable clipboard history saving. Two new Quick Launch Icons for plugins added to the main menu. And various bug-fixes. See the announcement for details. Besides building the new release from source tarball, an unofficial PPA is available that contains the packages for Ubuntu 16.04, Ubuntu 17.04, Ubuntu 17.10, and Ubuntu 18.04. In Addition, for Linux libxml2 bug see HERE. Sorry that I can’t build it with DBUILD_PATCHED_LIBXML2=1 option since it requires cloning source from github.com but Launchpad builders do not have internet access. To remove the PPA repository, launch ‘Software & Updates’ utility and navigate to ‘Other Software’ tab.